This past Tuesday, a massive crowd gathered around for the North American International Auto Show debut of the newest Acura NSX Concept – this time packing an interior that could be featured in the production version when it arrives in the near future. The Acura NSX is still only a concept car even though the company has made it more than clear that they do intend to offer a production version of this sleek hybrid sports car in the next few years. We have seen the NSX Concept at shows around the US as well as being featured in Roadster form for the movie The Avengers but in reality – we don’t know for sure what to expect when the Acura NSX finally arrives in dealerships around the country. We can expect that the exterior will remain relatively unchanged between the concept and production stages of the NSX, the interior has continued to be an unknown. The Avengers movie car featured fairly plain (and very non-luxury) Recaro race seats while the previous NSX Concept car that debuted at last year’s Detroit Auto Show was equipped with the dreaded blacked out windows so that there was no real way to see what was going on in terms of the interior layout. The newest Acura NSX Concept that was unveiled on Tuesday at the 2013 North American International Auto Show in Detroit has an interior layout that the company states is one of the directions that they could go with the NSX interior when the hybrid supercar heads into production. Having gotten a good look at this interior in person, I can say that this is a passenger compartment that would be very fitting of a high end Japanese sports car like the next generation of the storied NSX. There are a few elements that the modern supercar segment basically has to include in order to keep up with the high performance Jones’ and that list includes plush leather, carbon fiber, race inspired seats and gobs of modern interior technology from the gauges to the infotainment system – all of which the Acura NSX Concept touches on with this first look at the possible production interior layout. While there is some silver trim here and there throughout the cabin of the NSX Concept, pretty much everything is either wrapped in red leather, red suede, black suede or high gloss carbon fiber. The thin, race designed bucket seats have deep red leather bolsters with a red suede center section with more red leather on the doors and center console while black suede covers the upper door panels and the dash cap. The sides and back of the seats, the trim on the center console, trim across the dash, the steering wheel and the door panels are all adorned with glossy carbon fiber to complete that look of a proper supercar while the high tech gauge cluster and centrally mounted infotainment touch screen take care of the gadgetry duties. In short, this first look at the NSX Concept interior shows a design that could very easily slide right into production with very few changes beforehand – and very few complaints afterwards. On the outside, the Acura NSX Concept has undergone a few minor changes since the last time it was on display in Detroit’s Cobo Hall but these changes are subtle enough that most enthusiasts couldn’t put their finger on those changes without looking at images of both Concept versions side by side. Across the front end, the most recent NSX Concept has the same basic shape as the one that we saw last year in Detroit but the center section of the lower grille area has been altered while the open grated areas use a large mesh now rather than the fine mesh that we saw last year. Along the sides, nothing has changed aside from the new wheels on the most recent NSX Concept and out back, the biggest difference it the replacement of the old fine mesh for the larger mesh filler – similar to the change seen on the front end. The lower rear fascia area also appears to have a more filled in design with a more production friendly splitter compared to the sharper looking carbon fiber splitter used on the 2012 Acura NSX Concept. The Acura Design logo has been moved from the driver’s side of the license plate to the passenger’s side of the plate, a few inches higher. 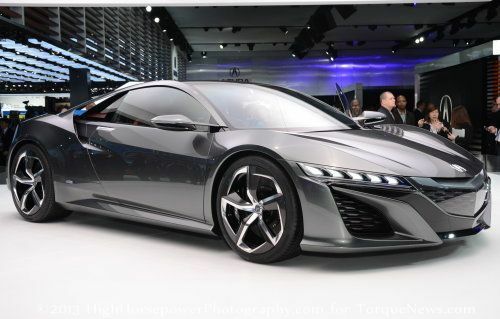 The bad news is that the Acura NSX Hybrid supercar is still a couple years away and it has seemingly been that far from production since the car was first introduced – making it unclear as to exactly when we might see this sleek fuel-friendly supercar in dealerships around the country. In the meantime, check out our pictures from the 2013 Detroit Auto Show by clicking any of the thumbnails above on the right and the video below from Acura offers a video game-like computer generated clip of the NSX in action around the world. Enjoy!